Cable is very strong in tensile strength and is a suitable in-fill material for a guardrail. There are many different types of constructions of cable — also referred to as wire rope. Most cable is designed to be flexible for going over pulleys or for lifting/moving heavy loads. Other constructions of cable are designed to hold something in tension, such as guy wire or a sailboat stay, and is less flexible. For any particular diameter of cable, the tradeoff for flexibility is strength. The opposite is also true. You compromise strength when you require a construction of cable that is capable of a higher degree of flexibility. When specifying any guard or railing system, it is critical that you review local codes to determine the suitability of the installation for your purposes. While the current model codes — such as the International Building Code (IBC) and the International Residential Code (IRC) — have no reference to the ladder effect, some local codes still refer to this restriction on horizontal and ornamental railing elements. If you are unable to use a horizontal railing, Wagner offers a Vertical Cable Railing System, which is described later on in this section. Cable flexibility is an important consideration in designing a cable railing. Most building codes state that a 4″ sphere shall not pass through any portion of a barrier on a guardrail/stair rail. Having the rigidity to prevent deflection of a horizontally run cable that is subjected to a vertical load is partly mitigated by the cable’s lack of flexibility. Therefore, it is our initial preference to use the most rigid of cable constructions possible when designing a guardrail using cable. The other factors are the tension of the cable, the span between supporting intermediate members, the diameter of the cable, and the vertical spacing of the cables on center. The next variable is the diameter of the cable. 1/8″ cable is too near the limits of the cable breaking strength and holding strength of the cable fittings when the cable is properly tensioned and then subjected to abuse, such as a heavy set person bouncing on one of the cables. 1/8″ cable is only recommended be in an area that is unlikely to experience pedestrian traffic. For most applications, 3/16″ diameter cable is suggested. When the scale of the project is large, a larger diameter cable may be preferred from an aesthetics standpoint. Wagner offers systems using up to 3/8″ diameter cable. Spacing of the cables vertically is critical, to minimize deflection of the cables under a vertical load. Our specifications provide recommended maximum vertical spacing of 3″ free opening between cables when they are installed. The last variable is the tension of the cables and the construction of posts to which mounting and tensioning hardware is attached. Deflection of the end posts must be minimized, and this is where Wagner have found the most mistakes made in the design of the railing framework. An incredible amount of tension is generated on an end post when you have ten or more lines, each tensioned at 225 lbs. over a height of 36″ to 42″. Often designers and fabricators inexperienced in cable railings will not recognize the amount of the tension applied to the posts. The end result all too often is end posts which will bend considerably as the cables are being tensioned…or with a railing where the cables cannot be properly tensioned without an unacceptable amount of post deflection. The posts to which hardware is mounted must be constructed so that they will not deflect perceptively as the cables are tensioned. The end posts in our specifications are designed to permit properly tensioned cables with a minimum of post deflection. 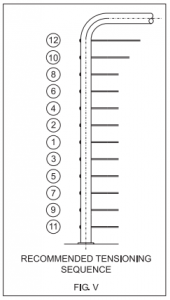 If you wish to design your own end posts, Wagner suggests that you contact us with regard to supporting the loads they will be subjected to and how they will interface with the hardware you will be using. 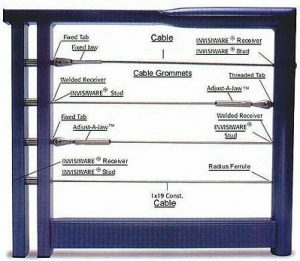 All of these variables work together to minimize the deflection of the cable so as to not allow a 4″ sphere to pass between the cables when they are properly tensioned in a well designed frame. Top and bottom rails are necessary in a vertical railing using cable, because mounting and tensioning hardware is attached to top and bottom rails instead of end posts. Wagner recommends schedule 80 pipe for both the top and bottom rail, because of the forces applied when the cables are properly tensioned. However, the amount of force that can be applied to a vertical cable is generally less than that can be applied to a horizontally run cable. The result is less force being applied to the mounting and tensioning fittings. Therefore, you may consider using 1/8″ diameter cable with a vertical system, where you would not want to use it in a horizontal system. Also, since there are no intermediate posts or braces to pass the cable through, the cables can be supplied by the factory already swaged. Wagner can also supply pre-drilled top and bottom rails, often at a considerable cost savings because of our automated drilling equipment.